You do. 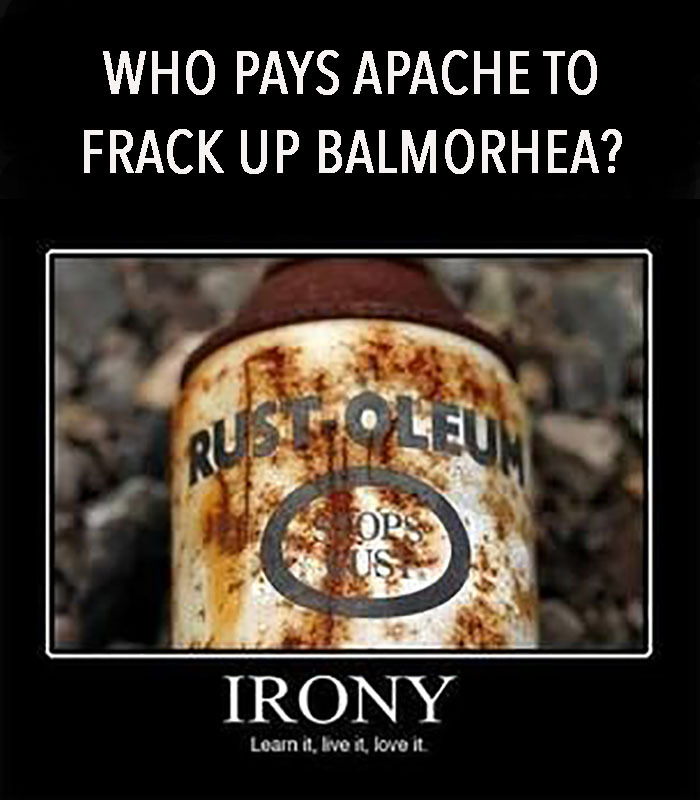 You Pay to Frack Balmorhea. Your tax dollars pay to maintain and protect the Balmorhea State Park, the endangered species that live there and the San Solomon spring. Your tax dollars pay Apache to frack Balmorhea and ruin the Balmorhea State Park, the endangered species that live there and the San Solomon Spring. Stockholm Environment Institute and EarthTrack released A REPORT Wednesday using work done by Oil Change International to calculate the value of oil production subsidies in the US. The report concludes: The oil industry only survives because of government handouts. 40% of Permian Basin oil production is dependent on federal and state subsidies. That is just for oil. Texas has an additional government handout for shale gas. There is no doubt that drilling 3500 wells in the area will ruin any value Balmorhea State Park has as a tourist destination. No one will go there to vacation and swim in the spring. People do not travel to heavy industrial zones to vacation. Additionally, the threat to the spring itself is huge. Without a handout from the government, Apache could not frack Balmorhea. artificially economic oil production by ending fossil fuel handouts. 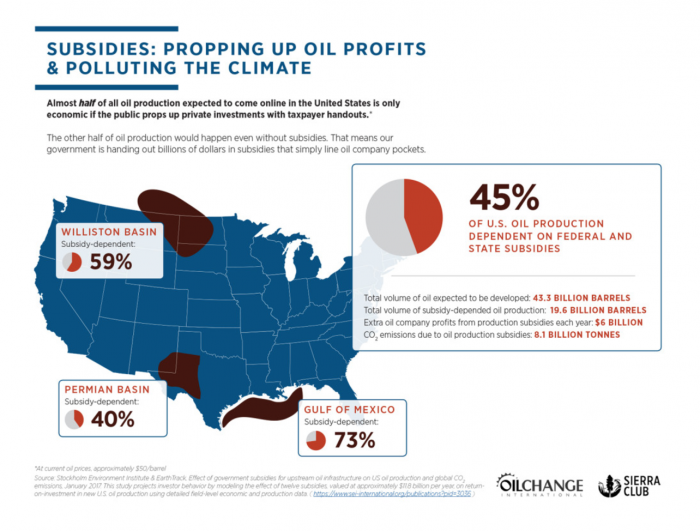 companies by phasing out all fossil fuel subsidies. government subsidies and their beneficiaries. Today in his Secretary of State confirmation hearing, Rex Tillerson said that Exxon does not receive any government handouts. That’s not true, of course. Call your elected officials today and tell them to stop the government handouts to the oil and gas industry. These hearings can be a joke sometimes. It’s bad enough no one is going to fact check what Tillerson says or claims during his testimony, or if they do, it’ll never make a damn bit of difference to those on the committee. What’s even more troubling is that Tillerson deliberately and intentionally circumvented US Policy (Iran Embargo) by having a foreign corporation act on Exxon’s behalf. Wash, Rinse, Repeat. With no commentary from you, Jon, it’s hard to know where you are coming from in posting that opinion piece. So to be clear: the author is not in support of continuing subsidies to the fossil fuel industry but rather the need to understand and reform the subsidies. There is no doubt that the author does not support continuing to base our economy and way of life on a dirty, finite fuel source that is killing us as he states in his opinion on resilience.org. We have choices and it is possible to quickly move away from a fossil fuel based economy. What we lack is the political will because the fossil fuel industry drowns our elected officials in BILLIONS of dollars in legal bribes. Apache does not need to frack Balmorhea to help Americans move forward. That gas is slated for export to Mexico and then on to Asia. There are some places that are just too special and too sacred to allow fracking. Why ruin one of those places for short term gain that will ONLY benefit Apache and their shareholders? There will be no benefit to the people in Balmorhea. Already in Craigslist there is an ad to sell 2 lots right in the city for a man camp. The tiny town will be overrun with the typical and well documented boom bust crime and destruction and a once global tourist destination will be left with nothing but pollution and dirty, rotting oil and gas infrastructure. Subsidies need to be reformed and the fossil fuel industry needs to pay for environmental damage so that we can move quickly away from fossil fuel use and convert to clean, renewable energy. Only clean, renewable energy will move America forward with a stronger economy and more jobs. Thank you fossil fuels, but now it’s time for you to die. Every time I have dug down on oil industry subsidy claims, I have found that the “subsidies” are failure to tax. We all get subsidies including the oil industry. The federal government subsidizes my house by not taxing income spent on interest. They also subsidize my health care and have for 50 years. When I see the billions in subsidies listed and details are reveled, the sum includes things like severance tax breaks, depletion allowances, expensing some well costs. I can assure you that the cash flow for the industry is to the government, not away. I am sure that everyone knows that the oil and gas industry is one of the few industries that is taxed on its feedstock. Like any industry, the oil and gas business has lobbyists and these lobbyists negotiate a few stupid tax breaks, but capitalizing and depreciating a useless hole in the ground sounds a bit inappropriate as well. A lot of this issue is moot; the EPA is going to be defanged, industry will be deregulated, and, as soon as the executive branch intimidates enough judges, environmentalists will have no recourse. We can all happily drown in our own filth and our greatest climate change threat will be nuclear winter. Environmentalists always have a recourse because we are creative.